Remodelando la Casa shared her top five projects for 2012 and her gorgeous kitchen makeover. Stunning!! New House to Home shared her top ten projects from 2012 including this teen room makeover. The Endearing Home showed how to turn a basic mum basket into a thing of beauty. So pretty. I just love this cork wreath from Neverending Decorating. She estimated about 500 corks for this wreath...now that's a lot of wine! 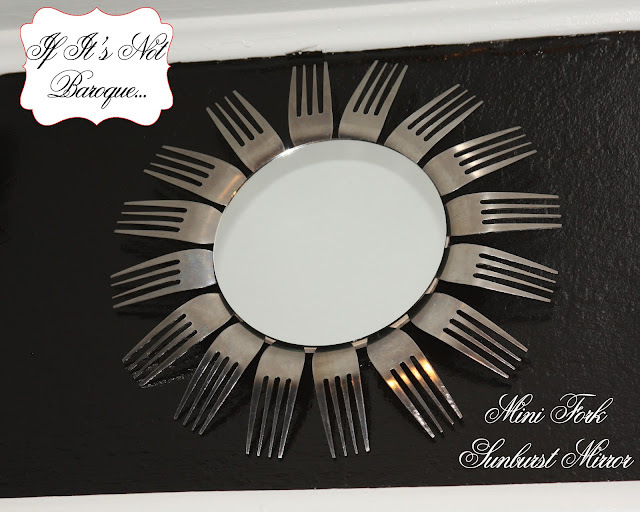 I think that this mini fork sunburst mirror made by If it's not Baroque is super cute. 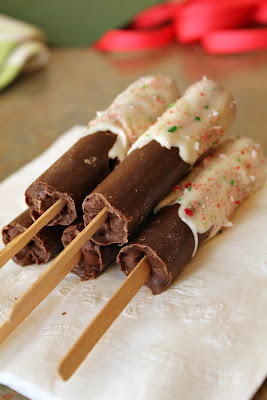 Zu Haus at Home shares her recipe for peppermint brownies. So yummy! Turtles and Tails shared her recipe for hot chocolate on a stick. Now this is definitely something I have got to try. Top This Top That shared two awesome ways to be happier in 2013. It inspired me and is definitely worth reading!! Thank you so much for hosting and for featuring my peppermint brownies!! Judy, thank you so much for featuring my Wine Cork Wreath! I had fun doing it and even enjoyed writing the tutorial. And yes...that WAS a lot of wine! Thanks again for the feature, have a great evening! Wonderful features! !...Thanks for hosting and have a great week!! Hey friend! Such amazing features! That fork wreath is so clever. Thanks so much for hosting us each week! I love all of these projects, especially the kitchen remodel and cork wreath - I can't wait to check out these new-to-me blogs! Thank you for featuring my daughter's bedroom along side these fabulous projects! Hi Judy...thank you so much for stopping by 21 Rosemary Lane and for the invite to your party! All linked up and wishing you a wonderful week!! Nice features, Judy! Thanks for hosting! What a lot of great projects. Love the basket in the features. It's all good! Thanks for hosting. Looks like fun. Judy, thank you so much for hosting and for featuring my kitchen, you made my day! Thanks for hosting the party! I love the cork wreath and all the features are great. love all those features! thanks for hosting. Thanks for hosting! I LOVE that basket! Awesome! Hi Judy, thanks for coming by and for the invite!! just linked up, thanks for hosting! Thanks so much for featuring my mini fork sunburst mirror. I really really appreciate it. Thank you for hosting, I enjoy comming over! I am linking some DIY Christmas presents I made for my family and friends, hope you'll like them! Have a great new year 2013! Wonderful features! Thank you for hosting, Judy. Thanks for a fun and creative party! Looks like a great party! Thanks for hosting!